For two months, Nicaragua has been through a major political crisis, fueled by clashes between law enforcement and an insurgency. Humanitarian organizations report a terrifying record of nearly 200 deaths. This violence, compromising the attempts of political negotiations, makes it necessary to understand who has an interest in paralyzing this Central American country. What are the motivations of protesters and opposition forces? Is the Nicaraguan government the symbol of absolute tyranny? It was a pension reform project that started the fire. To avoid privatizing social security as recommended by the IMF, the government wanted to increase contributions for both workers and employers. Faced with a public outcry, the government backtracked and withdrew its reform plan. But the protests continued without anyone being able to understand what was their objective. In order to stop the cycle of violence, government spokesmen called on the protesters to participate in peace commissions. They insisted on their willingness to listen to the various demands and to promote the expression of political opposition. To no avail. Calls for dialogue from the government have been shunned. On 14 June, the M-19 operation consisting of deploying “tranques” (barricades) in certain areas of the capital Managua, as well as in nearby cities such as Masaya or Granada, was supported by a “national strike” of 24 hours. This strike was convened by COSEP, the main employers’ organization. Yes, in Nicaragua, it is the bosses who call to strike! The world upside down? The fact remains that neither the majority of workers, nor the small and medium-sized enterprises followed suit. But it allowed an evaluation of the balance of power as well as maintaining the pressure until the next phase. On June 16, the day when the peace dialogue between the opposition and the government was to be revived, a new episode of extreme violence made the front pages of the international media. First, the facts. On June 16, a group of hooded people set fire to a building in Managua using Molotov cocktails, causing seven deaths, including a two-year-old child and a five-month-old baby. A mattress store occupied the ground floor of the building while the owner and his family lived on the first floor. Neighbors said they saw hoodlums throw their cocktails at the building, and said some shooters would have prevented the family from escaping. Accident as a possible cause was therefore immediately rejected. But private media like Televisa or BBC immediately seized the case to blame the authorities for the crime. According to their information, paramilitaries on government payroll wanted to use the roof of the building to post snipers; the paramilitaries, having been denied access by the homeowner, would have locked him up in his residence with his family before setting it on fire. This is the same thesis defended by the Nicaraguan Center for Human Rights (CENIDH), which pointed out “their complicity with the national police”. For other governments, this argument would appear simplistic, implausible and irrational. Who would have defended the idea that the British government was behind the fire of the Grenfell tower for example? But in the case of Nicaragua, the complicity or even the responsibility of the government is put forth as a matter of fact. According to the same testimony, the offenders carried “mortars, weapons, and Molotov bombs”. We can only respect the bereavement of the survivor. But it cannot be dismissed that under shock, and calling for divine justice, she felt the need to find an immediate culprit. This is why it cannot be excluded that her testimony has been influenced in any way so as to channel her anger and to politically exploit it. In an effort to get closer to the truth, it is necessary to look for additional information and to cross-check them with other testimonies and documents. However, these images have in fact been taken out of context: the recording was made on April 21, that is, at the very beginning of this crisis. What it reveals above all is that this precise area had been the scene of clashes between the two camps since the beginning of the crisis. This corresponds to information sent by Nicaraguan citizens, which indicates that the Carlos Marx district is controlled by the opposition. Indeed, it is hard to believe, as the opposition says, that police forces have surrounded the same neighborhood for two months, without being able to quell the protest movement until June 16, when they finally decided to use the roof of the Velasquez family to post snipers. And that’s not all. According to the same version, short of obtaining the family’s approval, the authorities acted brutally by setting the house on fire, without anticipating that it would cause a resurgence of tensions instead of calming them down. “We are not going to remove the barricades, they are in our hands and those of the people, and we will not take them off. I want you to know: if the people do not unite, it will end up in new massacres like this one”. But have their accusations, carried by certain media and Internet users on social media, been the subject of a real inquiry gathering enough facts? Retaliation against the right to work? Moreover, a disturbing screen shot of the April 19 movement was relayed via social media, including several photos of the owner of the premises, the father Velasquez Pavon, accompanied by explicit threats against him. The document dates from 2 days before the fire, that is to say at the time of the strike organized by COSEP. The commentary indicates that he did not respect the strike directive, preferring to continue working. In the eyes of his attackers, that would have been enough to make him automatically suspicious of sympathy with the government. The M-19 would have then relayed the identity and address of one of the future victims, threatening to “disappear” these “infiltrated” Sandinistas who “refuse to strike by pretending to support the people”. Since the release of this document, it appears that the text and photos have been removed from the account, the group administrators explaining that it could be a forgery. An explanation that did not convince everyone: some remember seeing these photos before the day of the fire, and point out that the area was under the control of the opposition, including through the “tranques” (barricades). Who to believe? We only have amateur videos published by Velasquez Pavon on his Facebook account in recent months. He proudly presents his mattress making workshop and says he works tirelessly. Would the small business owner Velasquez Pavon have been the target of opposition or paramilitary forces? Two days after the employers’ strike, would there have been any reprisals against the right to work of the Nicaraguan people? The dead do not speak; it is difficult to answer these questions. But respect for the victims requires a real independent investigation, which is incompatible with political and media manipulation. Who wants to eliminate the Sandinistas? Without the same outrage from the media, other killings and attacks have clearly targeted citizens and buildings associated with Sandinismo. On the same day that the Velasquez house was burned, a funeral home located a few meters from the house was also ransacked and set on fire. Still near the scene of the incident, two men were spotted in the street dismantling the barricades of the opposition. They were shot dead on the spot. The killers sprinkled gasoline on one of the corpses and set it on fire. Before leaving, they put objects on the burned body to create a macabre scene. It was Francisco Aráuz Pineda, from a historical family of the Sandinista Revolution. On May 28, the public prosecutor’s office in Masaya was subjected to arson, while the police reported an attack on their offices. On May 29 protesters set fire to the offices of Tu Nueva Radio Ya, considered a pro-government media. On May 31, the offices of Caruna, a financial services cooperative, were set on fire. On June 9 it was Radio Nicaragua’s turn, destroyed by the flames. That same day, a young Sandinista activist died in a motorcycle accident while trying to dodge a trap in a barricade in San José de Jinotepe, Carazo. On June 12, a gang kidnapped and brutally tortured 3 workers at San José College in Jinotepe. In the context of the clashes, 2 historic Sandinista militants were murdered. Also that day, the mayor’s house was ransacked and burned. On June 13, another group held captive and brutally tortured Leonel Morales, a leader of the National Union of Students of Nicaragua (UNEN). The emergency doctors at Bautista Hospital treated serious wounds caused by a bullet lodged in the young man’s abdomen, which would indicate a clear intention to kill. The authors of this attack had come from the vicinity of the Polytechnic University of Managua. On June 15, the day after the employers strike, Sandinista lawyer and activist Marlon Medina Tobal was shot dead while walking beside a barricade in the city of Leon. On the same day, demonstrators armed with mortars were spotted in Jinotepe town. On June 18, criminals threw a burning tire inside the house of Rosa Argentina Solís, a 60-year-old communal leader … for “totally supporting the government of the constitutional president Daniel Ortega and reminded that he had won the elections by a majority of votes.” The same day, the house of the mother of Sandinista MP José Ramón Sarria Morales was the subject of arson. Then nine members of his family were held captive and tortured. On June 18, Sandinista activist Yosep Joel Mendoza Sequeira, a resident of Simón Bolivar Matagalpa neighborhood, was held captive and savagely tortured. The same day, a video was relayed via social media, where a young woman accused of sympathy with the government is humiliated and tortured during an interrogation. On June 21, after being held by men manning barricades in Zaragoza, Stiaba, a young Sandinista youth activist named Sander Bonilla was savagely tortured under the impassive gaze of a priest. On June 22, an anti-Sandinist group fired at the house of the teacher Mayra Garmendia in Jinotega and burned the building where her family was, who managed to escape. The similarities with the crimes perpetrated in Venezuela by the anti-Chavista opposition a year ago suggest that this wave of violence is primarily motivated by a deep ideological hatred that goes beyond the framework of ordinary crime. To these brutal attacks that speak for themselves, we can add the confusion maintained by the protesters themselves with the complicity of the private media. On May 13, a Frente Sandinista activist, Heriberto Rodríguez, was shot dead in the head near a cinema in Masaya. The private media say he was murdered during a protest, portraying him as a martyr of the anti-government struggle, while Sandinismo’s Voice media claims he was killed by gangs of criminals allied with the right. On May 16, a group of demonstrators near the Metrocentro Mall in Managua threw down a metal art installation called “The Tree of Life”. After demolishing it, they stomped on it. The filmmaker of Guatemalan origin Eduardo Spiegler, who was there at the time of the incident, was crushed by the weight of the metal construction and died on the spot. His picture will be used to make it look as if he was a student victim of the repression, which some will denounce as manipulation. On May 30, the 18-year-old Mario Alberto Medina’s family, who died in September 2017, condemnsthe “unscrupulous actions of people who are using the young man’s photographs to add them to the list of dead”. Other people also discovered the presence of their name or photo in a list of dead claimed by the protesters: Christomar Baltodano, Karla Sotelo, Marlon Joshua Martinez, Marlon Jose Davila, William Daniel Gonzalez … Much like in Venezuela in 2014, the public was intoxicated by a massive campaign of fake news via social media. If we want to broaden the perspective, short of exposing the long history, it is necessary to return to the chronology of the facts. On June 15, the Catholic Church’s peace dialogue had just resumed after the talks had been interrupted since May 23. The new agenda between the government and the opposition renewed the authorization granted to a list of international organizations to participate in observation missions in the country, in order to identify all murders and acts of violence as well as their leaders, with an integral plan of care for victims in order to achieve effective justice. They included observers from the Inter-American Commission on Human Rights (IACHR), as well as the EU. An organization dependent of the Organization of American States (aligned with Washington), the IACHR had already carried out a mission between May 17 and May 21. Then it continued to issue reports, the last of which coincided with the day of the strike. Its record attributed to the government of Daniel Ortega the central responsibility in this crisis, while recognizing the presence of armed groups with “homemade mortars filled with gunpowder” in the ranks of the demonstrators. The wording is not very eloquent: the reader of the release is unlikely to imagine the scenes of horror that these groups were responsible of. On June 14, the Nicaraguan Foreign Ministry replied in a letter that the work of the IACHR had still not taken into account “evidence of atrocious crimes, cruel and degrading treatment, kidnapping and other acts of violence committed against the population and especially against public officials and persons known to be Sandinistas“. Given the biased stance it is accused of, the authorization to visit the premises that the Ortega government granted to the IACHR on June 26, must be considered as a concession in the framework of peace negotiations between the two parties. Especially since institutions like Amnesty International have clearly shown that they are on the other side of the barricade, turning a deaf ear to the testimonies that are not aligned with the dominant narrative. Caution is therefore required. If we assume the hypothesis of a political motive behind the frightening crime of the Velasquez house, the arrival of the investigators of the IACHR could have constituted a special motivation, in order to attract the international public opinion’s attention. Be that as it may, it did not take long to happen. United States “takes note of the general appeal of Nicaraguans for new presidential elections” and “considers that the elections would be a constructive way forward”! This statement contains a thinly veiled threat: it is an interference with the sovereignty of Nicaragua. It relies on a new balance of power, starting from the mid-June sequence – the strike and the peace agreement, undermined by the new violence of the weekend, which has had as a result the opposition leaving the negotiation table. Nauert therefore puts pressure on the Ortega government, which is now confronted on the one hand with increased street violence and lack of dialogue with the political opposition, and on the other hand with the arrival of the observation missions – who have probably already decided in advance the conclusion of their report. Is “regime change” a thing of the past? Unless one is uncontrollably naive, everyone will have noticed that the United States continues to regard Latin America as its backyard. For we cannot dismiss the role played in Nicaragua by a certain international activism, which is centered on the United States Congress, where the Nica Act was approved last November. Under the initiative of Ros-Lehtinen, a Cuban anti-Castro elected member of the Republican party, this law aims to stifle the Nicaraguan economy, blocking international loans. The reason? “Human rights violations, the regression of democracy in Nicaragua, and the dismantling of the free elections system in this country”. When the United States presents itself as the defender of human rights and the champion of democracy in the world, it should be remembered that in recent years bodies dedicated to “promoting democracy”, such as USAID or the NED, showered opposition movements with dollars (support that the protesters do not hide). Simultaneously, Senator Marco Rubio proposed to use the Magnitsky Act as a weapon of financial sanctions against the Vice-President of the mixed enterprise Albanisa. What was Rubio’s aim? Helping to overthrow the government elected by the Nicaraguan people is not enough, so you have to write directly a new constitution in its place, to prevent these latinos from returning to bad habits! All these mechanisms of destabilization correspond to the different phases of a real hybrid war. In the view of the neoconservative strategists, “constructive chaos” is far better than the loss of the areas of direct influence of yesteryear. If Nicaragua is again in the line of sight of US imperialism, the real reasons are mostly economic. As early as 1825, the Federal Republic of Central America, a political entity stemming from the wars of independence, had commissioned a study on the creation of a canal on the Lake Nicaragua Canal route. It was a strategic project for the economic development and survival of the young republic. But following the creation of the Independent State of Nicaragua in 1838, the Central American Federation broke out, dividing it into six different political entities (Guatemala, Belize, El Salvador, Honduras, Nicaragua and Costa Rica). What about the economic integration project in the region? It fell into oblivion. 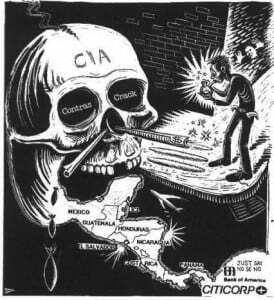 For the United States, the break-up of Central America was therefore very advantageous from a strategic point of view. In 1846, the Colombian government signed with the United States the Mallarino-Bidlak Treaty, by which Colombia was to ensure free circulation in this region, where the United States planned to create an inter-oceanic canal. Following the vision of US Marine Corps Captain Alfred Thayer, the goal was to better control maritime trade. The new agreement offered US troops the pretext to intervene militarily 14 times, relying on the legal foundations of the treaty. Thus the United States played a decisive role in the separation of Colombia and the Department of Panama on November 3, 1903. As a reminder, as early as 1823, the United States had issued a warning to the European powers who would be tempted to regain control over the young emerging republics. It was the famous Monroe Doctrine: “America for Americans”. Translation: The United States were keeping a “right of interference” on its southern neighbors. Well, in 1850 the United States signed a similar treaty with England, which since 1661 had established a protectorate over the coastal region of Mosquitia, allying itself with the indigenous Mosquito people against the Spaniards. The agreement between the two powers provided for the shared control of the coast and the circulation of goods in the future canal. But in 1860, Nicaragua signed another agreement with England, by which it formally renounced the protectorate. In its place, the Kingdom of Mosquitia was created, with a constitution based on English laws. In 1904, Mosquitia was finally incorporated in Nicaragua. On December 6, 1904, facing the US Congress, President Theodore Roosevelt proclaimed the “Big Stick” doctrine, also known as the “Roosevelt Corollary.” This foreign policy was practiced in the period between 1898 and 1934 where, in order to protect its commercial interests, the United States occupied several Latin American countries, in what would become known as the “banana wars”. William Howard Taft, who had been appointed Secretary of War in the Roosevelt administration, did not hesitate to use force in several countries. Significantly, the same Taft was responsible for overseeing the construction of the Panama Canal, which was finally inaugurated in 1914. It must be remembered that the initial project for the construction of the Panama Canal was first granted by Colombia to France thanks to the signing of the Salgar-Wyse agreement. The works, led by Ferdinand de Lesseps, the engineer responsible for the Suez Canal in Egypt, began in 1878 and lasted ten years, but was abandoned in 1888. The abandonment of the project by the French led to the United States resuming the idea of the canal and commissioned a study of the American Congress at the Walker Commission. Finally, the choice was on Nicaragua and a construction treaty was signed. But this country opposed the granting of a route planned by the United States, and envisaged the possibility of granting it to Germany. In retaliation, in August 1912, the United States sent troops to Nicaragua. They would only return home after 21 years of occupation, turning the country into some sort of protectorate. The invasion served the purpose of preventing another country from building a canal in the area. In 1916, the newly elected Adolfo Diaz government, with the kind support of the US Marines, signed with the United States the Bryan-Chamorro Treaty, through which that country obtained the concession for the canal for a period of 99 years and the authorization to install a naval base. The success of the Panama Canal and the long invasion of Nicaragua by the United States threw the other canal project into the dustbin of history. But not forever. Daniel Ortega, the historical leader of the Sandinista Revolution who was president of Nicaragua in the 1980s and re-elected in 2006, brought back the project. In 2013, the National Assembly approved a law granting the concession of the new Transoceanic Canal to the private Chinese company HKND. If it saw the light of day, it would be three times the size of the Panama Canal. In other words, there would be a serious competition issue.